Growing up in Louisiana provided Annette with ample opportunity to observe nature and life around her. She enjoys the discovery process of seeing something new and different every day during the creation of a painting. Annette expresses her interest in movement of line, color and the interplay of flat shapes against areas of depth in her paintings. She incorporates themes of nature, dance, water, human interactions and abstract concepts in her work. 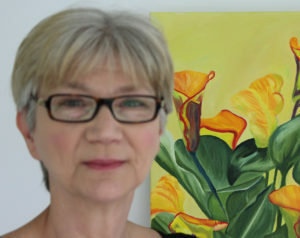 She paints with oils, acrylics, oil pastels, watercolors and mixed media. Annette teaches art to interested students. She has had paintings in Juried shows in Florida. She received a Bachelor of Fine Arts Degree from Louisiana State University. Featured Artist of the week at FloridaArtistsRegistry.com September 1, 2014. Contact Annette for more information about her artwork.